I feel like Christmas is sneaking up on me way too quickly and I'm not getting anything done that I wanted too. I normally make fun snacks and crafts with the kids, and haven't done any of that yet this year. 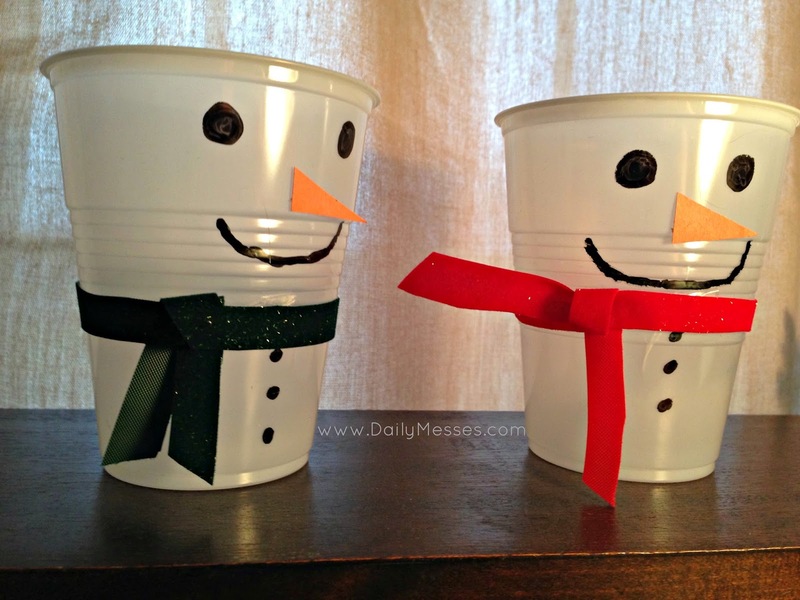 I made these cute snowman cups for snacks. I am going to fill with popcorn (like little snowballs) but it could be used for anything. I drew on the eyes, mouth, buttons with a Sharpie. I cut out a triangle from orange construction paper, and taped it on (if you had an orange Sharpie that would be easier). I had ribbon out from wrapping a present and used it to make the scarves. While I made these today, I think Eugene is going to leave them as a surprise for tomorrow.